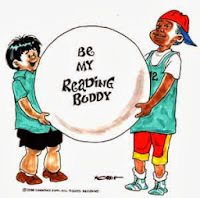 The week of October 12-19 is Magic Tree House Reading Buddies Week. Buddy Reading is when a younger reader is paired with a more skilled reader. The purpose is for the younger reader to practice their reading skills and to hear how fluent reading sounds. It's a great way for a parent to read to their child, by each of them taking turns reading a page or chapter. The library has a vast collection of Magic Tree House books as well as a great series called We Both Read, where the right page is written at a specific reading level for a young reader and the left is written at a more sophisticated level for an adult reader.